F.M. 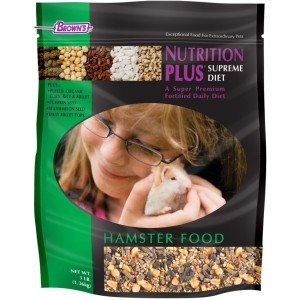 Brown's Nutrition Plus Supreme Hamster Food 6/3 lb. "Nutrition Plus Supreme is formulated to make mealtime fun and a source of activity. Its balanced, right-sized bites of wholesome morsels is enhanced with chunky, crunchy puffed fun-to-eat organic millet, corn, rice and our hand-cut spray millettops. "Nutrition Plus Supreme is formulated to make mealtime fun and a source of activity. Its balanced, right-sized bites of wholesome morsels is enhanced with chunky, crunchy puffed fun-to-eat organic millet, corn, rice and our hand-cut spray millettops. Plus we’ve added watermelon seeds, pumpkin seeds, peanuts and our nutrient-fortified fruity, tasty, fun-shaped Zoo-Vital biscuits to help ensure the well-being of your pet. All in all, it’s a stimulating, hearty, healthy diet that your hamster will find irresistible!"